Keep food, dishes, or other small items from cluttering your work area with this Regency 12" x 24" solid stainless steel wall shelf. Each shelf is made of 18 gauge, 430 stainless steel with a #4 finish and comes with 2 support brackets. This shelf has a maximum capacity of 210 lb.. The corners are solid welded and polished to a matching finish. All raw edges are ground smooth and free from sharp edges. A nice little stainless shelf to hold some kitchen items. Very sturdy. Make sure you have 24" OC Studs to screw this in, too heavy for drywall. The perfect stainless steel microwave shelf! Well built, easy to install, easy to clean and the perfect size for a small microwave. Arrived in perfect condition. This shelf looks works great for holding our coffee supplies in our office. The stainless looks nice and is easy to clean the coffee grounds off. Sturdy and perfect for the job. Bolted quickly and securely to the wall and held our microwave firmly in place. Would buy again and definitely recommend to potential buyers. Great shelf!! Pricing is the best we found and comes ready to assemble. Assembly is easy, did not need instructions. Just make sure not to over tighten the bolts, these screws are tact welded. Came with wrench.Great table!! This shelf is sturdy and solid. It doesn't bow or bend under the weight of our condiments and keeps the kitchen neat and organized. Highly recommended! These little shelves are great for smaller spaces or adding on to other shelves. Our kitchen is very small but these guys help us out tremendously. Be careful when tightening down the nuts as the bolts coming off of the shelves can break if you torque it too hard. I purchased this shelf to storage my dry goods and I was pleased with the packaging and the easiness to install it. I bought others different sizes as well, but If I had to repurchase the items, I would choose this size, because this sizes covers a lot of space. Heavy gauge steel will hold anything you put on it as long as it's securely mounted. Easy to assemble in just a couple of minutes. This shelve mounted easily and was the perfect fit for our food truck. Very sturdy and made of good thick steel. We will probably by more in different sizes! The 12" x 24" has been a great addition to our storage solutions. We have a very tight kitchen, and so every inch counts. These were mounted over the sandwich cooler, in an area we thought to be dead space. These are no-joke shelves, that when coupled with upgraded hardware store anchors (heavy duty, and I mean HEAVY duty...) are capable of holding up serious weight. Pictures coming soon. These shelves are great for any space! they are sturdy, easy to install, and they look great. Can be used in a kitchen or even in a lobby or elsewhere. Very solid and great value. If you have a small space that you need a shelf this squeezes in tight spaces. Regency makes good products. I ordered two of them, one inside the kitchen, the other one in the storage room as chemical shelf. They both works pretty well. Seems could support heavy staff. Maybe will order more of this kind of shelf. Bought shelves to mount above sink and utility room. Added lots of extra storage space and the metal was of highest grade. Easy mounting and very firm. Good solid wall shelf. It was easy to install and works well for holding our containers. Being stainless steel it is easy to wipe down and clean as well. I love these shelves! I've purchased a handful and in different sizes to outfit my custom built kitchen where everything is stainless. Very easy to install, I did it myself and easy to clean. I prefer solid shelving over rack shelves as there's no chance of anything getting stuck or making a mess. This stand is installed over my mop sink to hold all of my cleaning supplies and chemicals. It's very sturdy and holds up great! Helps keep the area tidy as well. Great value! I have now purchased 10 of these. We use them upside down to hold a fancy label maker to time and date our products. It is sturdy and it's size is perfect as you will see in the picture. we bough three of these to install in our café and they are great. extremely sturdy (make sure you buy your own screws and plastic inserts to mount on the wall as they are not included in the package). A great quality and priced 12"x24" solid wall shelf. I got this to use in our small broom closet to hold trash bags and cleaner. It fit perfect and was easy to assemble. Perfect size for small restaurants, holds a great amount of cups, coffee, oils, pasta colanders, etc. Really loved the strength, NSF label, and overall look. 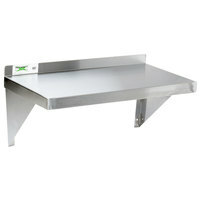 We purchased the Regency 18 guage stainless steel 12" x 24" solid wall shelf to store our kitchen POS system. It has worked well and looks good too. Ended up using this as a drainboard over my sink and it turned out to be a wonderful idea! saves space and is big enough to hold everything. Nice, small shelving unit. The units arrived as expected, and are easy to hang. They hold quite a bit of product and are a great addition to our kitchen. Great shelf, very sturdy. We have a 70 sq ft kitchen and maximizing space is of utmost importance. We stack all of our plates on this shelf, probably about 100 pounds or more of plates. We installed this through the wall so that there are washers on the back side of the wall (covered with a chalkboard so no one sees) but gave us the extra strength of the shelve being adhered not only into a stud but clear through the wall and fastened on the other side. I use this item for putting some chemical cleaning stuff, it is firm and good quality, the more important thing would be the good price for it. This stainless steel 12" by 24" solid wall shelf is great for storage in a restaurant. Strong and well built. Easy to wipe down and clean. Good quality shelf. We got a few of them and we are very happy. The only down size is that you need good anchors to make sure it doesn't fail under weight. This shelf will match my other stainless items, but there are two issues that I have with it. Look at the photos of the copper studs that are threaded that have been spot welded onto the underside. They are poorly attached and what's worse is they are at an angle that doesn't line up with the other holes. Second is that the mounting is not spaced 2 feet apart, so you can't mount to two studs. Shipped very quickly, so thanks for that. Will have to drill one bracket mounting hole to get it to fit. Otherwise, not bad for the money! I was very pleased with this shelf when it came in. No scratches or dents on any that I bought. Easy to put up and even hold my heavy glass root beer float and milkshake glasses just fine. This brand is the real deal, the best price and high quality stainless steel. They are absolutely the best. Whenever we need more, will be definitely ordering this brand! the shelves are made out of a nice and thick sheet of steel, nice and sturdy, However the studs used to mount the side brackets were not welded in place straight so it took a bit of wiggling to get them to mount right. Not a huge issue because once it's up, it won't be coming apart often. Not the highest quality stainless steel, magnets do stick to it. These shelves are fantastic! Great quality and craftsmanship. They are a breeze to install and are great for tight spaces where you need just a bit more storage. We are very limited in storage space in our tiny kitchen so we have to go vertical. These are easy to cleanand easy to install and cost a lot less than other restaurant supply sources! These shelfs are designed to put were ever you need more wall storage made of sturdy stainless ,and ther are no sharp edges. Nice quality. Having limited square footage, this stainless steel wall shelf was just what I needed. It's perfect for storing and having my spices and some small hand tools right in reach. Not just a space saver but a time saver! Good for the price and holds up well. Webstaurantstore has great prices, better then other websites and the quality isn't bad at all so I would recommend this product. This is a great shelf for the price! Very sturdy and easy to clean. Install was also very simple, it went up within 10 minutes. Thank you for your review! We are sorry these shelves have not suited you. A Customer Solutions Representative will be contacting you shortly. I can't have enough of these and the price is unbeatable. Got them in a day from Georgia and I'm in Central Florida. No one can beat this price. Great shelving , great price. I just hung a 12 x 24 shelf yesterday in my basement cooking sanctuary. Great for storing extra fry pans spices and whatever else you need to keep out of the way. Nice brushed s.s. finish too! Shelf is a great deal for the price. It's the perfect size for all of our supplies. Holds up well to kitchen staff and easy to clean. on the shorter length shelves-- like this 24", 18 ga seems sufficient to hold a decent amount of weight with little flex-- the shelf is also bolted to the bracket which helps. On longer lengths, I used the 16 ga Regency shelves. all good value. This shelf is strong enough to store no. 10 cans or any weight you can put on it. Good quality construction, Would reccomend to anyone looking for a sturdy shelf. Bought these for a game kitchen in my own home for above my stainless sink. For the money you cannot beat the value! There is a slight trick when installing if your walls are not straight. all you ned to do is adjust the bottom nuts that are included and also a slight gap on the back of the wall may be needed to get it straight. Awesome shelf and will be buying several more. I've said it time and time again, you can't beat the value you get from Webstaurant store! Always high quality, great pricing, fast shipping, and this item is no exception. Bar and restaurant is a tough business with slim margins, and you guys help us out! Thanks!